(Nanowerk News) Like other users of microfluidic systems, National Institute of Standards and Technology (NIST) researcher Javier Atencia was faced with an annoying engineering problem: how to simply, reliably and most of all, tightly, connect his tiny devices to the external pumps and reservoirs delivering liquids into the system. While pondering this one day, he randomly picked up two magnets and began playing with them. As the magnets pulled apart and then snapped back together, Atencia realized that he had his solution. In a paper recently published online in Lab on a Chip,* Atencia and colleagues describe the result of that brainstorm: a new, inexpensive, reusable and highly efficient microfluidic connector. The NIST connector employs a ring magnet with a O-ring gasket on its bottom and a tube in its center set directly atop the inlet or outlet port of a microfluidic channel embedded in a glass chip. A disc magnet on the underside of the chip holds the first magnet—and its tubing—securely in place. Photograph showing the use of the NIST magnetic connectors with a microfluidic device designed to generate liposomes. The microchip has five inlets and one outlet, all linked to tubing via the magnetic connectors. The inset at upper right shows the setup of the tube-magnet combination. Unlike traditional approaches to connectors—such as gluing the tubing directly to the chip or mounting a male/female connection with the tubing attached to the male portion—the NIST magnetic connector is reusable; can be positioned anywhere on the chip; and eliminates any possibility of broken bonds that leak, chips cracked during heat curing of the glue, or microfluidic devices turned useless by excess glue entering the channels. Additionally, the reliability, flexibility and fast assembly of the NIST connector compares favorably to a recently developed press-fit system (where springs produce the sealing force) but the magnetic connectors cost hundreds of dollars less to build and operate. As reported in their paper, the NIST researchers demonstrated the viability of their magnetic connector in a microfluidic device designed to generate liposomes (tiny bubble-shaped membranes that can be used to transport drugs throughout the body), a fairly port-intensive task. A solution of lipids suspended in isopropyl alcohol is pumped at a high rate into a microchannel through one inlet and hit with a buffer solution pumped in through four other ports. The convection and diffusion that occurs as the liquid streams mix produces liposomes that exit the microfluidic device through an outlet port. Magnetic connectors at the five inlets and one outlet were removed and reseated numerous times without any visible leakage. 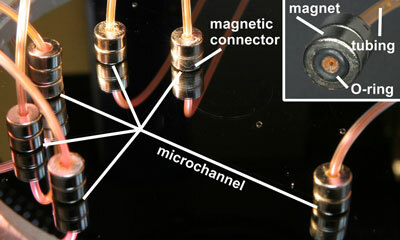 The NIST researchers state that their magnetic connector is suitable for most microfluidic applications except those dealing with iron-containing (ferro) fluids, superparamagnetic particles (particles so small that their magnetic properties decrease with time and fluctuations in temperature), cells tagged with magnetic particles, or high-temperatures (greater than 80 degrees Celsius). NIST is seeking a patent for the magnetic microfluidic connector. Once the patent application is filed, the technology will be available for licensing. Interested parties should contact Terry Lynch, NIST Office of Technology Partnerships, [email protected], (301) 975-3084. * J. Atencia, G. Cooksey, A. Jahn, J. Zook, W. Vreeland and L. Locascio. Magnetic connectors for microfluidic applications. Lab on a Chip. Published online Nov. 16, 2009.